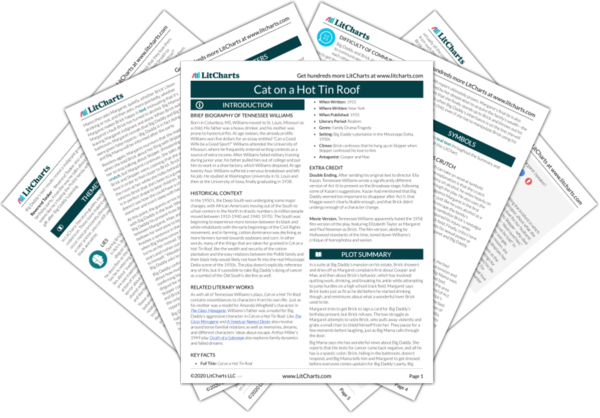 Instant downloads of all 946 LitChart PDFs (including Cat on a Hot Tin Roof). 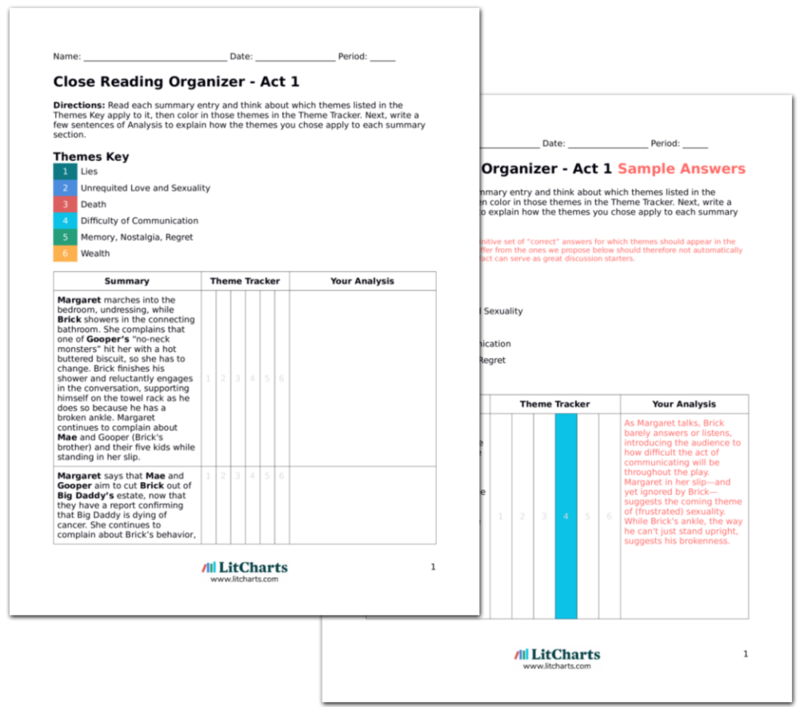 LitCharts assigns a color and icon to each theme in Cat on a Hot Tin Roof, which you can use to track the themes throughout the work. Everyone but Brick trickles back into the room, calling for Big Daddy. Big Mama says that she believes Big Daddy has left because he was just worn out, but was really very happy to see family. Margaret goes to the gallery to fetch Brick, while Big Mama starts to get nervous that the family is gathering around her. Mae suggests that Brick said something he shouldn’t have said to Big Daddy, and Big Mama wants to know what that might be. Before Gooper can say anything, Mae rushes over to Big Mama and gives her a hug, which Big Mama impatiently pushes off. Big Mama starts talking about Brick’s drinking, as Brick appears in the room behind her. Brick immediately heads for the liquor cabinet. Big Mama’s little lie about Big Daddy being very happy to see the family is a perfect example of the type of mendacity that Brick rejects—the kind of lie that society teaches us to spread in order to maintain social harmony. It's unclear if Mae is expressing true emotion for Mama here, or is just continuing to try to ingratiate herself with Mama while driving a wedge between Mama and Brick. Brick, for his part, after being forced to reveal himself, once again rushes to alcohol to protect himself from feeling anything. Margaret tells Brick to sit with Big Mama as they deliver the news, but he tells Margaret to sit with her instead. Gooper and Mae reveal the news that Big Daddy actually does have cancer. In hysterics, Big Mama calls for Brick, her “only son.” This statement offends Mae and Gooper, and Gooper asks what that makes him. Big Mama responds that Gooper never liked Big Daddy. Reverend Tooker slips out. Doctor Baugh leaves a package of morphine on the table in case Big Daddy has pain, and then he leaves as well. The truth finally comes out to Big Mama, who doesn’t handle it well. Her hysterics, however, are further evidence that her affection for Big Daddy is genuine. She even denies Gooper as her son based on Gooper's dislike of Big Daddy. She has, it seems, completely sublimated herself to Big Daddy. Tooker has made his efforts to secure money for the church, now he leaves when things get rough. Big Mama tells Margaret that she’s got to help get Brick sober again so that he can take hold of the estate, which sends Gooper and Mae into a panic. They say that Brick is much too irresponsible to take hold of things, and Margaret comes to his defense, saying that Gooper and Mae’s campaign against Brick is founded completely in avarice and greed. Gooper, furious, admits that he does, in fact, resent Brick and Big Daddy’s favoritism, but he knows enough to protect his own interests. Mae and Gooper grow increasingly nasty towards Margaret and Brick as Brick reenters the room. Big Mama tells them to hush, and Gooper signals for his briefcase. He pulls out a large sheaf of papers and says that he’s drafted a trusteeship. Infuriated, calling the document "crap" because that's the word Big Daddy uses when he's disgusted, Big Mama tells him to put it away or she’ll tear it up. Gooper and Mae reveal how much of this meeting revolves around Big Daddy’s inheritance, as Margaret accuses them of greed. Gooper also references his past—his own unrequited affection for Big Daddy—and reveals his resentment towards his parents for their favoritism. As the situation becomes tenser, communication also breaks down further, with insults coming out into the open. Meanwhile, Brick is drinking and singing to the moon. Big Mama says that he looks just like he did when he was a little boy. Big Mama tells Brick that Big Daddy’s fondest dream would be to have a grandson from Brick. Mae responds that it’s too bad Margaret and Brick can’t oblige. In response, Margaret grows determined and says she has an announcement to make. Margaret announces that she and Brick are going to have a child, and Big Mama gasps in happiness, while Gooper and Mae dismiss the news as false. Brick’s alcoholism again acts as a barrier between him and the others, removing him from the conversation. Big Mama still dotes on him, however, even though he’s unreachable—she reaches into her memory of Brick in order to love him. Big Mama's comment that Big Daddy would like Brick to have a son indicates another way that Big Daddy might achieve immortality—through the line of his one son whom he loves and in whom he sees himself. Seeing an opportunity, Margaret tells the play’s final lie. And just as Mama has clung to every other lie, she clings to this one, likely settling the question of inheritance in Brick’s favor—though this isn’t said explicitly. Big Mama rushes out to tell Big Daddy the news, while Mae screams that Margaret is lying about her pregnancy. Mae says that she and Gooper can hear Maggie and Brick in the room and know that Brick won’t sleep with her. Suddenly, a cry of pain and rage fills up the house, and Mae and Gooper run to go see what it is, leaving Brick and Maggie alone in their room. Mae tries to reveal Margaret’s lie, even though she hasn’t been entirely truthful throughout the play either, spying and withholding information about Big Daddy’s health report. The cries of rage are implied to be in response to Big Mama's news about Maggie's baby, and further imply that Big Daddy doesn't give a crap about "immortality" gained through Brick's baby. Big Daddy wants to live for himself! Margaret finally takes charge at the end of the play. Earlier Maggie couldn't penetrate Brick's alcohol-based distance; but now she (like Big Daddy earlier) realizes that Brick's dependence on alcohol makes him weak, symbolized by Maggie throwing away his crutch and defense. She can, basically, extort his love for her, at least physically. Love continues to be a function of power—suggesting that the women's love for their men is almost entirely a function of their dependence on them. But now Brick is dependent on her. Further, Maggie realizes that with this power she can be the first character in the play to turn her lie into truth. Even Big Mama’s interruption doesn’t faze Margaret, who calmly hands Big Mama the medicine before returning her attention to Brick. Mama, meanwhile, goes to "ease" Big Daddy's pain—but his pain is emotional and existential. In essence, Mama is putting Big Daddy on a drug much more powerful than alcohol, and all because of her sincere love for him. Big Daddy wants to live, but Big Mama, now that she has control over him, is going to ensure merely that he survives, all motivated by love. Maggie, in her power, similarly tells Brick her truth—that she loves him—and he, echoing Big Daddy earlier in the play, doesn’t believe her. He sees it as just one more lie people tell each other. However, unlike Big Daddy in his earlier scene with Big Mama, Brick is weaker than Maggie at this point. His rejection doesn't matter because she doesn't accept it. Cao, Diana. "Cat on a Hot Tin Roof Act 3." LitCharts. LitCharts LLC, 26 Nov 2013. Web. 25 Apr 2019. Cao, Diana. "Cat on a Hot Tin Roof Act 3." LitCharts LLC, November 26, 2013. 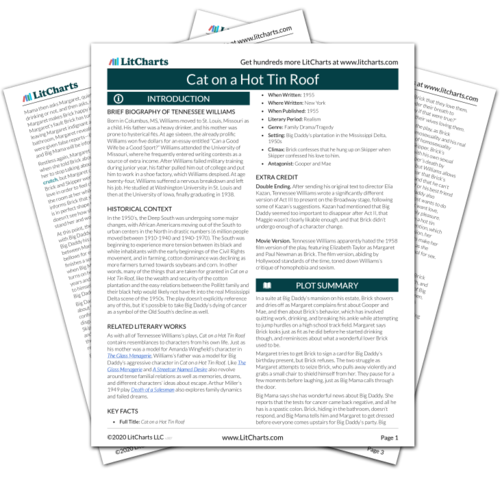 Retrieved April 25, 2019. https://www.litcharts.com/lit/cat-on-a-hot-tin-roof/act-3.